- 1 - PALISADES CONSULTING IP Telephony: Keeping New York Competitive in the Global Marketplace Eva Lerner-Lam President Palisades Consulting Group, Inc.
3 - 3 - PALISADES CONSULTING Silicon Alley in an Infrastructure “Do- Loop”? We’re leading the world in high tech development of the Internet BUT--are we falling behind in deploying the infrastructure for global competitiveness? 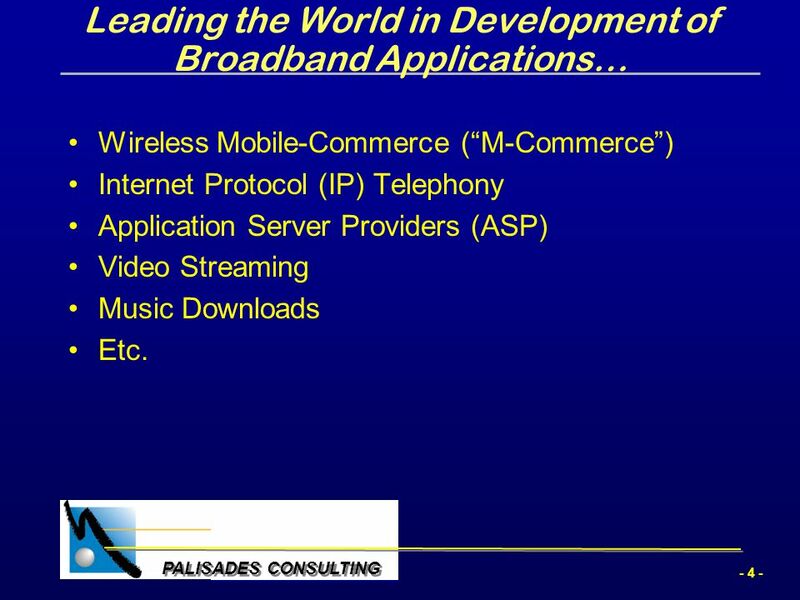 4 - 4 - PALISADES CONSULTING Leading the World in Development of Broadband Applications… Wireless Mobile-Commerce (“M-Commerce”) Internet Protocol (IP) Telephony Application Server Providers (ASP) Video Streaming Music Downloads Etc. 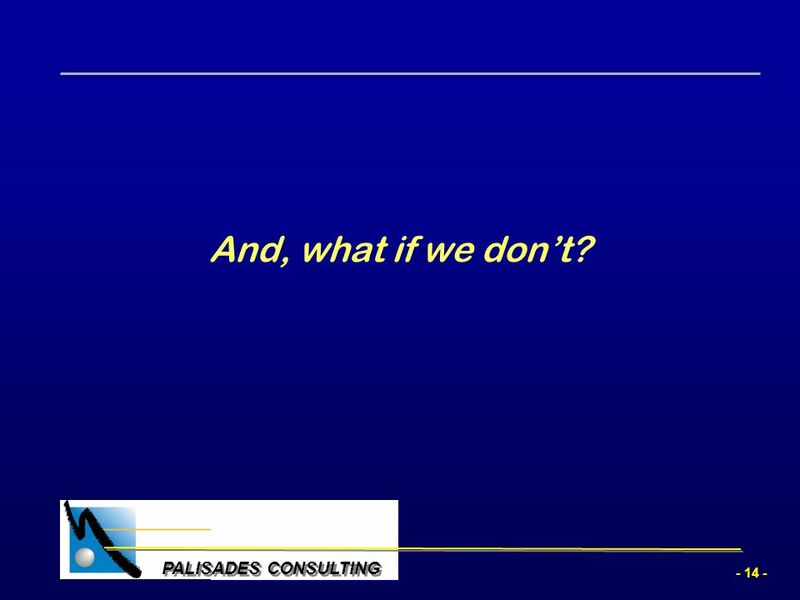 9 - 9 - PALISADES CONSULTING What if…? We organized national consortia to collaborate in the design and building of functionalities for ubiquitous Internet access? 10 - 10 - PALISADES CONSULTING What if… The Consortia consisted of hospitals, schools, utilities companies, social services organizations, banks, financial institutions, transportation agencies; in short, all major infrastructure sectors? The Consortia offered training and certification in design, engineering, construction, operation and maintenance of the backbone and support networks? 11 - 11 - PALISADES CONSULTING What if…? 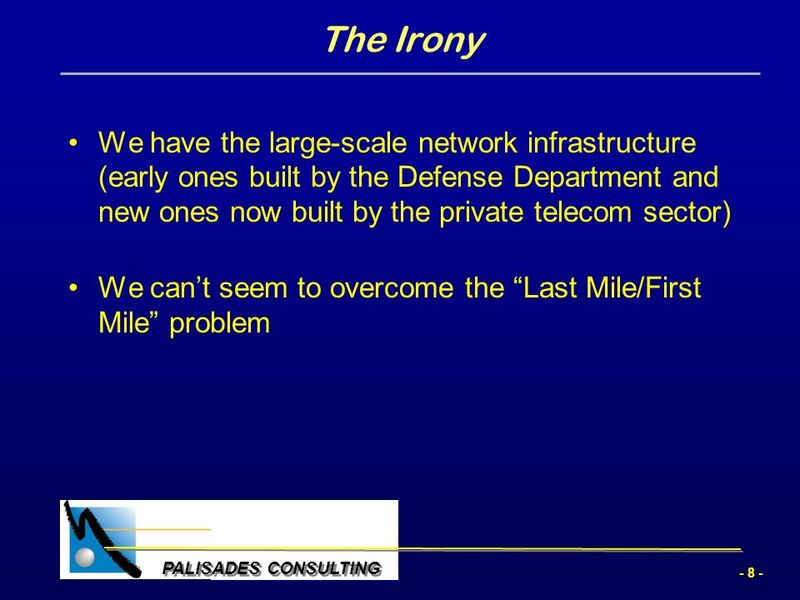 The Consortia provided a mechanism for the pooling of resources to overcome the “Last Mile/First Mile” problem? 14 - 14 - PALISADES CONSULTING And, what if we don’t? 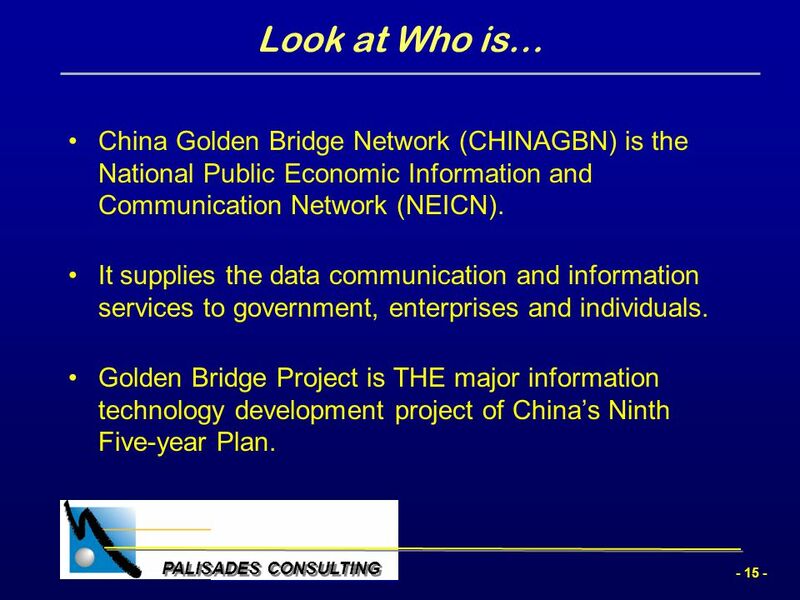 15 - 15 - PALISADES CONSULTING Look at Who is… China Golden Bridge Network (CHINAGBN) is the National Public Economic Information and Communication Network (NEICN). It supplies the data communication and information services to government, enterprises and individuals. Golden Bridge Project is THE major information technology development project of China’s Ninth Five-year Plan. 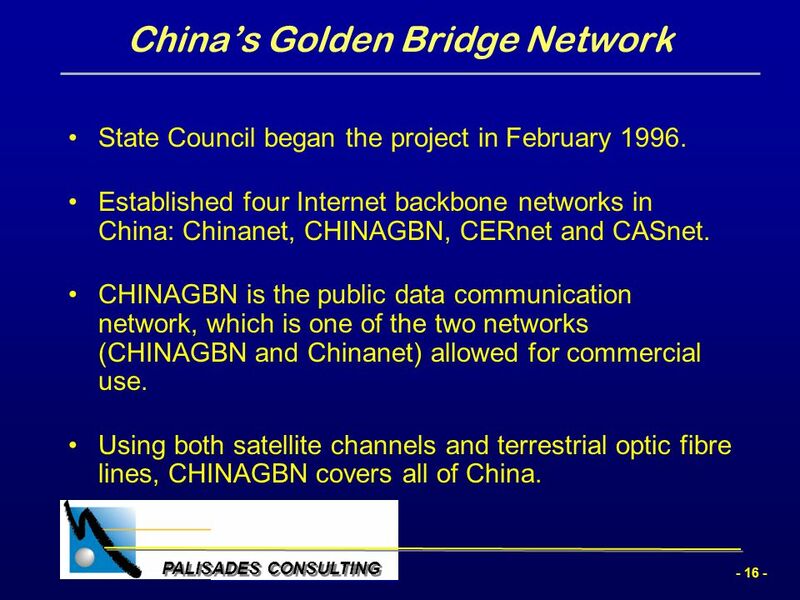 16 - 16 - PALISADES CONSULTING China’s Golden Bridge Network State Council began the project in February 1996. Established four Internet backbone networks in China: Chinanet, CHINAGBN, CERnet and CASnet. CHINAGBN is the public data communication network, which is one of the two networks (CHINAGBN and Chinanet) allowed for commercial use. Using both satellite channels and terrestrial optic fibre lines, CHINAGBN covers all of China. 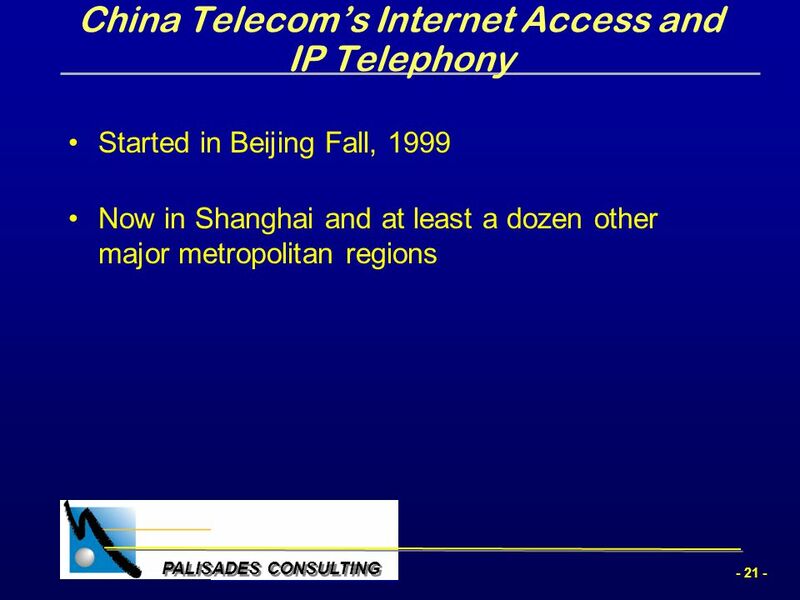 17 - 17 - PALISADES CONSULTING China’s Golden Bridge Network CHINAGBN has established 10 backbone nodes in the cities of Beijing, Shanghai, Guangzhou, Wuhan, Shenzhen, Qingdao, Shenyang, Dalian, Changchun, and Chongqing.BeijingShanghaiGuangzhou WuhanShenzhenQingdao Shenyang Dalian ChangchunChongqing There are hundreds of group users, enterprises and ISPs that have connected to CHINAGBN; they were instrumental in the development process of the Network. 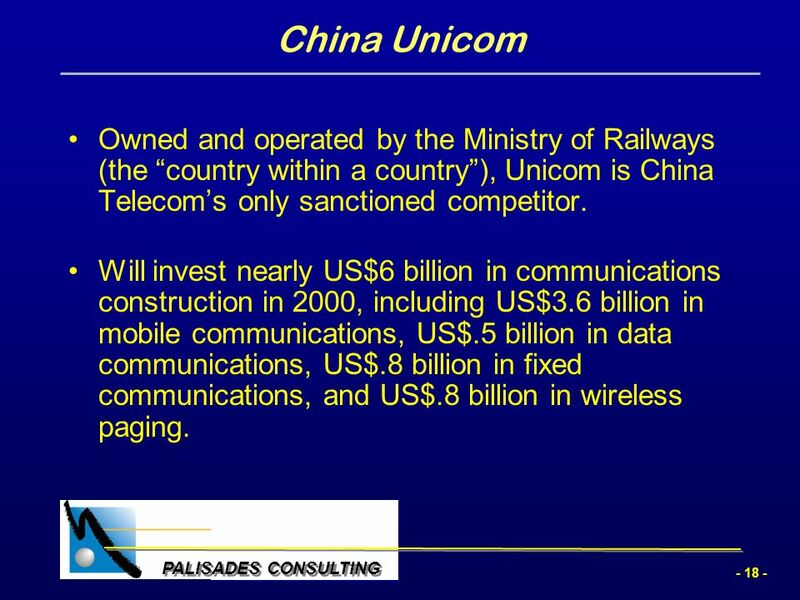 18 - 18 - PALISADES CONSULTING China Unicom Owned and operated by the Ministry of Railways (the “country within a country”), Unicom is China Telecom’s only sanctioned competitor. Will invest nearly US$6 billion in communications construction in 2000, including US$3.6 billion in mobile communications, US$.5 billion in data communications, US$.8 billion in fixed communications, and US$.8 billion in wireless paging. 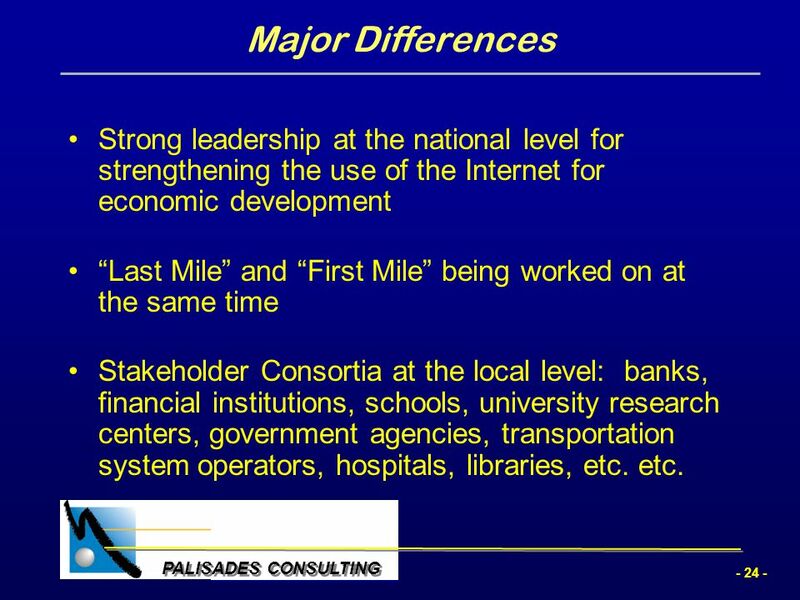 24 - 24 - PALISADES CONSULTING Major Differences Strong leadership at the national level for strengthening the use of the Internet for economic development “Last Mile” and “First Mile” being worked on at the same time Stakeholder Consortia at the local level: banks, financial institutions, schools, university research centers, government agencies, transportation system operators, hospitals, libraries, etc. etc. 30 - 30 - PALISADES CONSULTING Local Examples Blacksburg, VA: Building a “smart community” with Virginia Tech Concord, MA: Looking to joint ventures with cable, ISP’s and telephone company Falcon, CA: Forming partnerships with local Internet service providers to offer residents high-speed Net access. 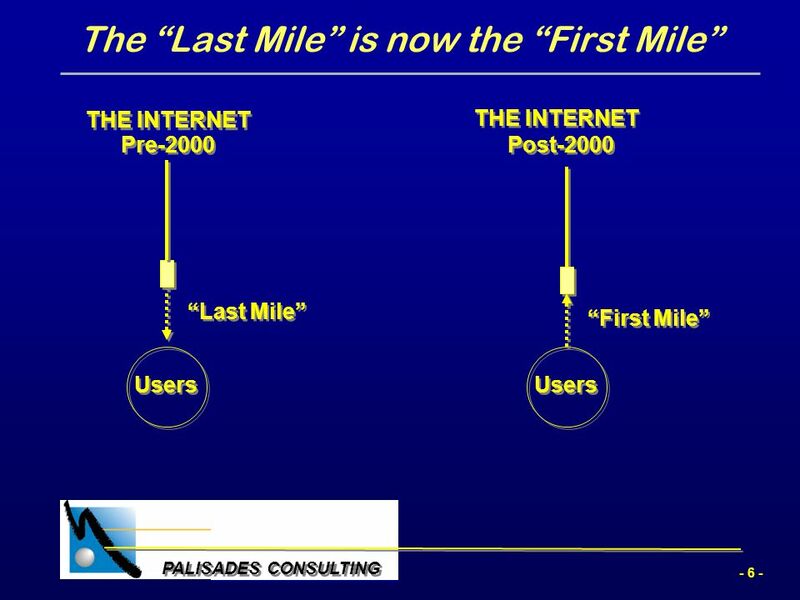 Palo Alto, CA: The "Last Mile" initiative to connect Palo Alto residents and businesses to the City's Fiber Ring information infrastructure. 31 - 31 - PALISADES CONSULTING SUMMARY We lead the world in technology and broadband applications, but we’re stymied by the “Last Mile/First Mile” obstacle Our global competitors are gaining on us at our “Achilles Heel” Let’s organize a national framework and implement a strategy for overcoming the “Last Mile/First Mile” problem so we can get on with the business of global competition. 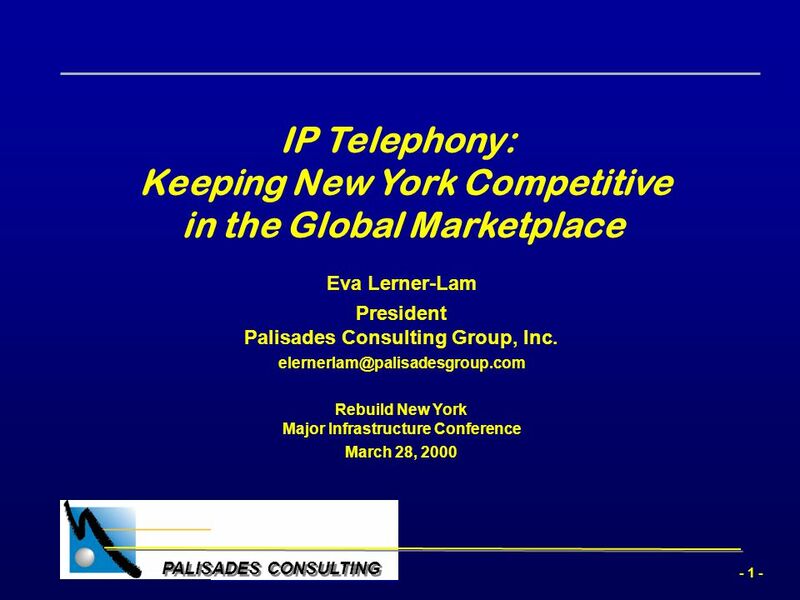 Download ppt "- 1 - PALISADES CONSULTING IP Telephony: Keeping New York Competitive in the Global Marketplace Eva Lerner-Lam President Palisades Consulting Group, Inc."
Providing the right Backbone Infrastructure for Broadband Folu Aderibigbe, Head Glo1. World Telecommunication Development Conference Doha, Qatar Press Conference March 6, 2006 ICT for Development for All: Current Trends, Analysis & Regulation. MANWEILER TELECOM CONSULTING, LLC Gila and Pinal Counties Community Telecom Assessments. 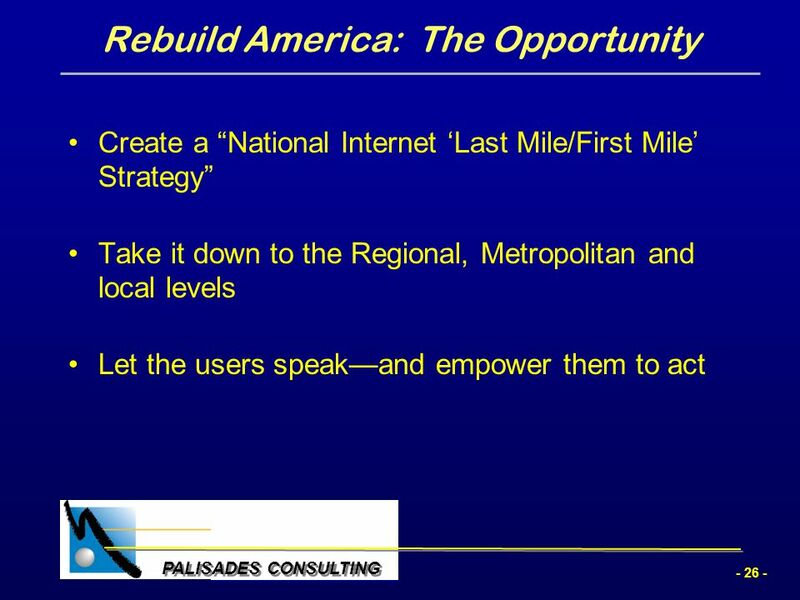 1 Broadband Deployment & Adoption Efforts in California. Opportunities and Challenges of Operating Both GSM & CDMA Networks Dr. William Li General Manager Marketing & Sales Dept. By Harmeet Singh.  When India became independent in 1947,it already had about 82,000 telephone connections which rose upto 3 million in year 1985. The Mobile Centric Internet Country :China Project for COM546 By Simon Chen. Ministry of Education, Youth & Sports (MoEYS) SWAN The Schools-Computers Wide Area Network Project ”BUILDING THE BELIZEAN KNOWLEDGE SOCIETY… Using. TECHNOLOGY GUIDE 5 Basics of the Internet and the World Wide Web. 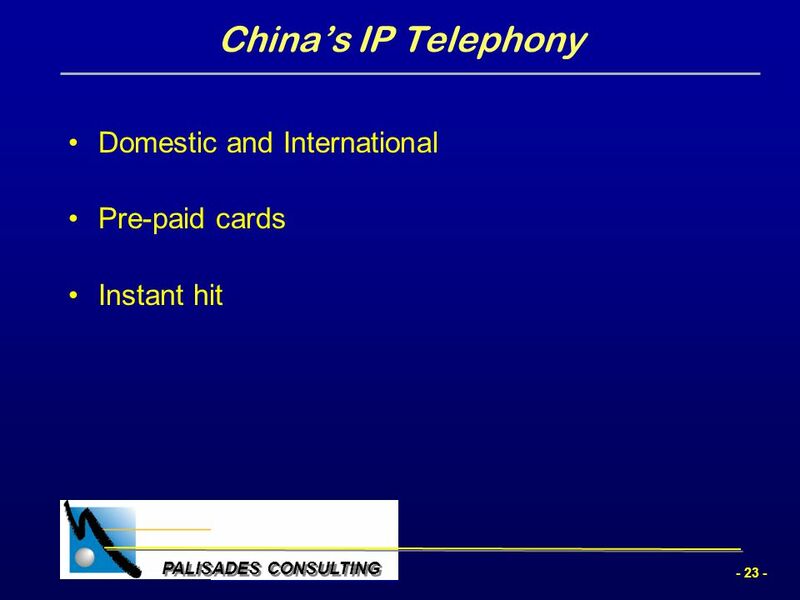 Telecom Market in China François BRUN Deputy Vice President, Corporate Strategy Alcatel IDATE conference - Montpellier 29 November, 2003. © 2007 Verizon. All Rights Reserved. PTE /07 FCC Workshop Global Broadband Connects the World Jacquelynn Ruff Vice President, International Public. PACIFIC CENTURY Presented by Group 1B. PACIFIC CENTURY Agenda 1)Background of PCCW 2)Industry Life Cycle 3)Key Strategies -Where to compete -How to compete. Telecommunications in India Arun Babu Helen Ezenwa Parul Parikh Ajay Patel. BJARNI THORVARDARSON CEO May 2015 Hibernia Express Providing Direct Access from Cork, Ireland to North America and Europe Hibernia Networks 2015 Private. Community Information Centers Cambodia Bridging the Divide Workshop April 23 rd 2005. CSE 5806 Telecommunications Management Group Two Group Assignment International Telecommunications - Structures & Regulation. ISP (INTERNET SERVICE PROVIDERS).  An ISP (or Internet Service Provider) is a company that offers users a connection to the internet. WHAT IS AN ISP?